Back in my youth I had to be home when the street lights came on. Being the typical kid, I was heading home after the street lights came on. One spring night I came across 2 mosquitoes sitting on a street sign. One mosquito said to the other “you want to eat him here or take him home”. The second mosquito replied “if we take him home the big ones will get him”. Well I took off like the mosquitoes were chasing me. Luckily I beat them to the house. This bring us to the current spring and the winter that never was. 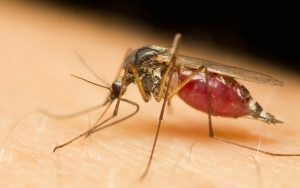 Usually, May is the official start of mosquito hunting season. This year the season has started a little earlier. Remember the good old days when we just had the mosquito bites, Malaria and encephalitis to worry about? Now we have West Nile and Zika! The one thing that we all must remember is there is no magic bullet for controlling mosquitoes. The best battle plan is to eliminate the environment that mosquitoes need to live and breed. Stop the larva by having no standing water. I cannot emphasize the importance of keeping your gutters clean. Keep the grass cut short, beds maintained and don’t overwater your landscape. Do not forget to treat your bubblier and French drain lines along with rain barrels and saucers for the potted plants. You can treat these areas with products like Mosquito Bits or Mosquito Dunks. The active ingredient is BT (bacillus thuringiensis) with the subspecies israelensis, or just call it BTI. Promote habitats for the purple martins, bats, and dragonflies. They don’t eat as much as you think but every little bit helps. Plant a variety of herbs including citronella and lemongrass, as most have a repellant effect. Change outside lighting from white to yellow light bulbs or lenses, as they tend not to attract these flying vampires. Don’t forget the citronella Tiki torches and candles. They have a small effect on mosquitoes but you will get that island feeling. Two of the relatively new kids on the block is the very effective Patio Egg. Spartan Mosquito Eradicators are the most innovative mosquito control products to hit the market in a long time. They are sold in a two pack that covers an acre. As always read and follow the label directions but here is the short course. Fill the eradicator to the proper level with warm water and place them in the shade no more than 180 feet apart. Because they attract mosquitoes, keep them away from the areas that you hang out in. Keep the water in the eradicator at the proper level and they will last about 90 days. The use of sprays and granule repellents in the environment is an option. One of the best all-natural sprays is a cedar oil product called Yardsafe by the Cedarcide folks. Others include citronella, garlic and orange oil sprays. Synthetic sprays include permethrin, cypermethrin, and lambda-cyhalothrin (Cyonara). Granulated cedar and garlic work as repellents. Permethrin granules are used as broad-spectrum insecticides. The all-natural repellant sprays will last about a day but the granules will last substantially longer. Synthetics, both liquid and granulated will last from two days to a month. Length of effectiveness for all products will hinge on the weather. The last resort is to hose yourself down with a repellant of some sort. Products that contain cedar and marigold oils are on the all-natural side. Synthetics include Deet, permethrin and believe or it not Avon’s Skin so Soft. For better or worse, products containing Deet are the most effective.